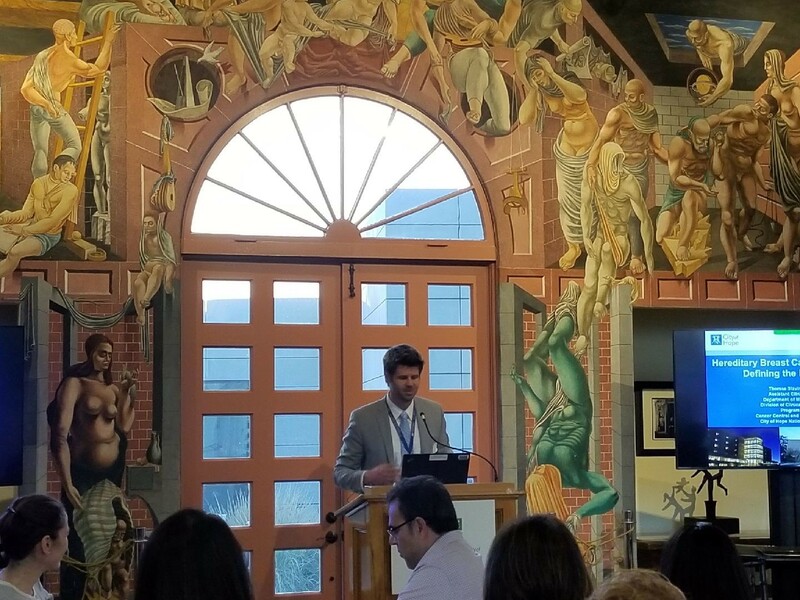 https://cdn2.hubspot.net/hubfs/644585/SoCal%20Cyto%20and%20Molecular%20meeting%201.9.2018.3.jpg At the latest SoCal region Cytogenetics and Molecular Genetics meeting, there was much discussion over the future direction of genomic variant detection and classification in oncology. At the latest SoCal region Cytogenetics and Molecular Genetics meeting, there was much discussion over the future direction of genomic variant detection and classification in oncology. The meeting began with an excellent presentation from Dr. Thomas Slavin, Assistant Clinical Professor in the Department of Medical Oncology & Therapeutics Research at City of Hope. Dr. Slavin presented his work to better understand gene-specific risks for developing breast cancer. One of the major insights of his talk was that there are very few genes which have a statistically significant relationship to breast cancer susceptibility. The remainder often return results that are not clinically actionable, highlighting the need both for more large case-controlled studies on proposed breast cancer susceptibility genes. To learn more about the work Dr. Slavin presented, you can view his paper on Nature.com. The meeting continued with case/research presentations by Victoria Bedell, M.S. (City of Hope), Dr. Gordana Raca (Children’s Hospital of Los Angeles), Dr. Abbas Padeganeh (City of Hope), and Dr. Milhan Telatar (City of Hope). The meeting was an opportunity not only for the presenters to share their work, but for Laboratory Directors and Technicians from the entire Southern California region to learn from each other’s expertise. Attendees discussed technical issues facing their lab, new advances in genetic testing technology, resources to find or contribute to clinical guidelines and more. We are looking forward to the next regional meeting which will be hosted at Kaiser Permanente on April 25th! Contact us to RSVP.